As part of our ongoing campaign to contribute towards the "Save our Tigers"campaign , we have planned a series of posts about Tigers. This is to create awareness about these beautiful creatures and educate people about them. Tigers are part of the cat family, scientifically known as Panthera Tigris. They are apex predators and are Carnivores(am sure you knew that!!! ), which means they are on the top of the food chain, and survive from nutrients in their prey's flesh. Tigers are large Cats . They can reach lengths of more than 3 meters and weigh up to 300 kilograms. These animals are characterized by large dark stripes from the top to the bottom of their body, which run along thick fur;tthe colour of which ranges from a dark orange/red to near white with lighter under colours. A popular misunderstanding is that the white coloured tigers are a seperate sub species. However that isnt true.The White Bengal tiger, for instance isnt a "white" tiger. Its colour arises from a recessive gene which gives it the pale white colour and blue eyes. Another example is of the white siberian Tiger, the existence of which has not been proved, though there have been reported sightings of white tigers in the areas where Siberian tigers live.It could also be possible that Siberian tigers that had a gene for natural white coating have been extinct long back. Additionally,there have been so far no white siberian tigers born in captivity, and the white siberian tigers that you see at Zoos are because of the breeding of the Bengal Tiger and Siberian Tigers. The Bengal tiger most commonly has the gene for white coating. Where did the name Tiger come from? "The word "tiger" is taken from the Greek word "tigris", which is possibly derived from a Persian source meaning "arrow", a reference to the animal's speed and also the origin for the name of the Tigris river. " Tigers are usually found in the dense cover of Forests. These forests can range from mangroves to semi evergreen to deciduous forests. Unlike lorides of Lions, dense vegetation is well suited for Tigers to hunt. Most Tiger habitats will have easy access to prey and water and dense cover.Tigers are good at swimming and will actively seek out water body's to relax in the high temperatures of the day. Tiger Habitats once extended from Western Asia to Siberia and Indonesia. In the 19th century the Tigers vanished from Western Asia. Modernization and human civilization along with poaching has lead to these magnificent creatures disappearing from their habits. Today Tigers are endagered and protected species. Their Major habitats are now around India, Sumatra, China and south East Asia. The Tigers on Java and Bali were extinct in early 20th century, and the tigers of Borneo are only recognized by their Fossil Remains. There are numerous programs which have been up to save these creatures, but unfortunately corruption,poaching and illegal hunting of these creatures have driven tiger populations to the brink of extinction. Recently Aircel has started a campaign called Save our tigers. This is a campaign to create awareness on the Tiger being an endangered species and on the brink of extinction. We have currently around 1400 tigers left in the country, surprising, because the Tiger is India's national Animal. Am sure many of us would have known for quite some time that the Tiger numbers are going down. This has been so to a variety or reasons and excuses. But I have decided to contribute however I can. One is to sign up on the Save our tigers campaign started by Aircel. Second I will use my blog to communicate on everything that can is related to Tigers. I will also actively Tweet and FB my way around until I get something out of it. I am also putting this communication in all possible ways across to as many people as possible. 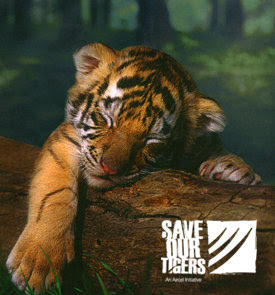 Please sign up at www.saveourtigers.com. This is the least you can do. Keep Roaring. The Tiger needs us. Past few days I have been researching on the money making aspect of blogs, and found it to be a really simple (NOT easy) and lucarative business. However what the speciality of your blog is going to be is up to you and your interests. Anyway...ideas come along once you sit and vision what you enjoy doing and you can adapt that too your blog. The most important thing is keeping it going, so think before you jump into it.